When a young player goes to string their stick for the first time, there’s a lot of pressure. If they mess up, it will hinder their practice participation because they’ll be ‘off’ or fixing their stick. 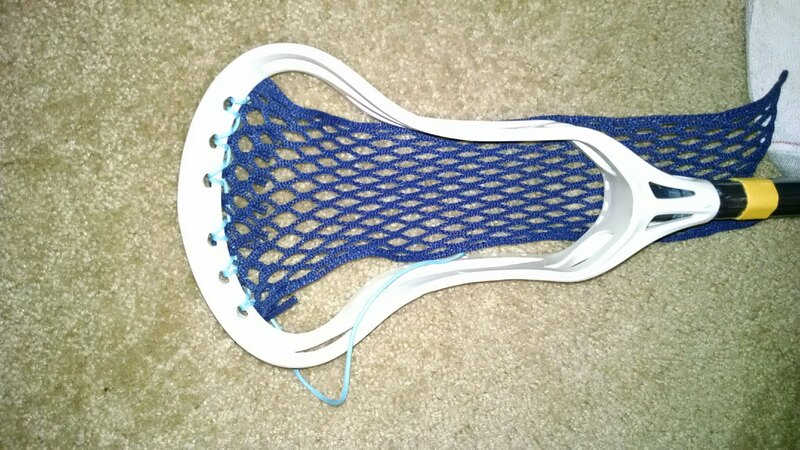 I learned by unstringing my lacrosse stick, then trying to put it back together. It took a lot of memory and practice, but I got it pretty quickly. Before that, my sticks were strung by my lacrosse coach in high school. Before one goes blindly into stringing their sticks, which is how I did it, today’s multitude of lacrosse technology calls for doing some basic research. 1) Whip—how much do you want? This is used as the word for release point of the ball. Tighter strings will create more whip, releasing the ball lower (ideal for d-poles and midfielders who fake a lot). Looser strings allow for less ‘whip’ and will release the ball sooner/towards the sky. 3) Channel—the route/direction of the ball’s release. For me, this part naturally falls into place as you string the stick and break it in. A channel is used more by advanced players without shooting strings. Some people believe the ‘shooters’ slow the ball down; not having them creates less control. 4) Depth—the deepness of your pocket. Obviously has to stay legal, but more depth can create more control, whip, hold, etc. 5) Head selection/shape—to put it in basic terms that I use, where the wider part meets the narrowest part of your stick is where a natural pocket creation will happen, so try to plan its placement there. 1) Cut the ‘shoe lace’ strings using the scissors but not blindly. Measure the lengths necessary to complete both sidewalls and the top row. You’ll have extra left over for the bottom strings. Some people use a black marker to mark the strings then cut. 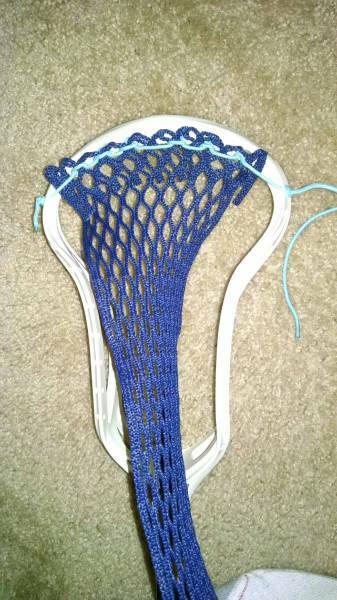 2) The first part is the absolute hardest part of the stringing. This needs to be super-duper tight to withstand future elements (wet grass, etc.) and allow for a smooth and easy release. Tie a knot at one end of your string (1 of the 3 you should have after cutting) and lace the whole length through the first, top hole on the sidewall. I prefer to start from the left, stick facing away from me, and work across. Continue with the string to lace through a mesh hole, up through the first hole on the top wall. With the stick facing away from you, this thread should go through said hole pointing away from you. This is where it gets tough. The rest of the way, you’ll need to keep the progress you’ve made super-duper tight. While keeping it that way, bring the string down under the top wall, back towards you over the first lace, wrap it around through the next mesh hole to the right, up throw the same hole on the top wall but this time back towards you, pull the loose end through the little loop you’ve created and pull extremely tight. Repeat these steps through the rest of the holes. Final product should look like above picture. Finish off with another knot on the other side of the head. 3) Sidewall—Every head is designed differently (well, different product lines) and therefore have a few sidewall holes to what seems like hundreds. 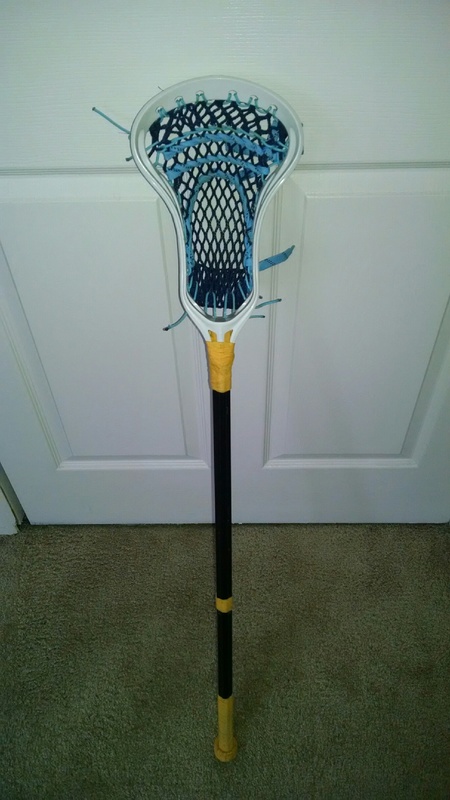 The head in the pictures is a Warrior Swarm, and has 10 sidewall holes. I used 8 of them, finding an area to skip in the middle. 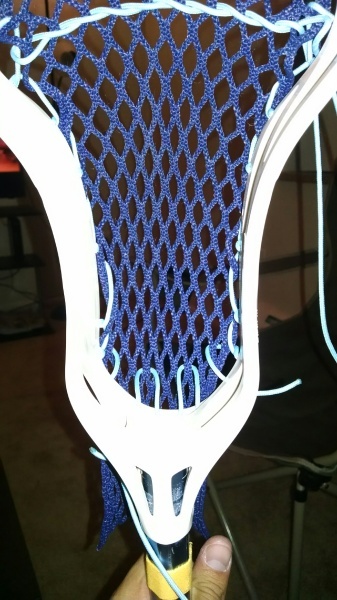 If this is your first time stringing, it will unfortunately come down to experimentation (or, if re-stringing a head, try to remember which holes the sidewall strings filled and use those). Start with a knot at one end of another ‘shoe lace’ string. Lace from the outside-in of the sidewall hole just below the top one you used. The way I string my sidewalls (others do it differently), I wrap the lace through a mesh “sidewall” and down the next hole which you again go outside-in. 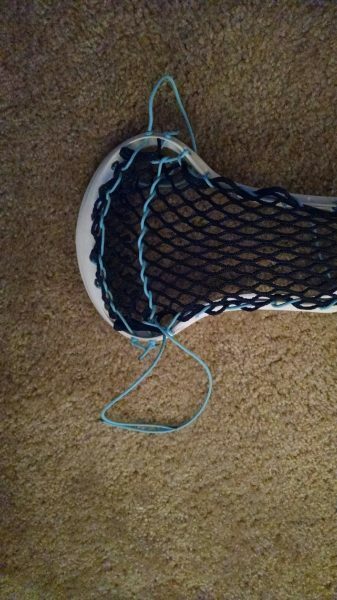 Upon pulling the string through, wrap it over the length you just laced and then into another mesh “sidewall” hole lower down. Repeat this process down the side. 4) Do this all again down the other sidewall, and make sure to stay even with the holes on the first side. The sidewalls can have a big impact on the ability to form a pocket. Notice on my stick above that in certain spots it’s looser, and stays pretty loose the entire way along. 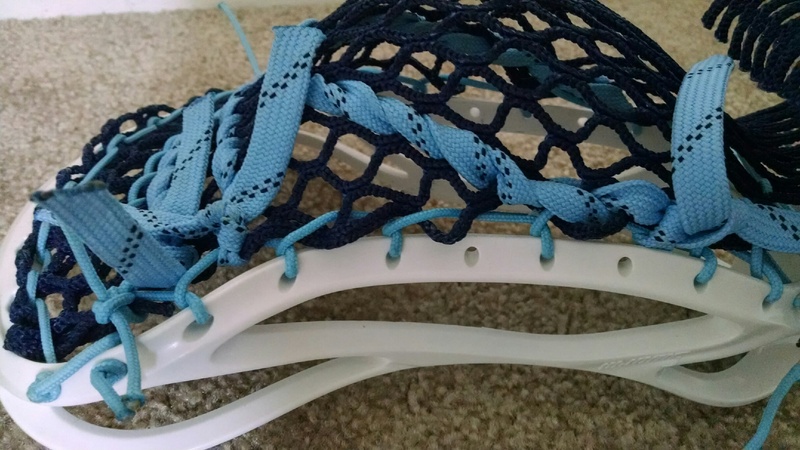 Unlike the top string that has to be knuckle tight, the sidewalls should leave room for a little slack. 5) Bottom String—Using a small portion of your leftover string, tie a knot at one end and (this is the easiest) just weave it through the mesh and bottom holes. Only pull as tight as you want your pocket deep. Looser = deeper pocket. 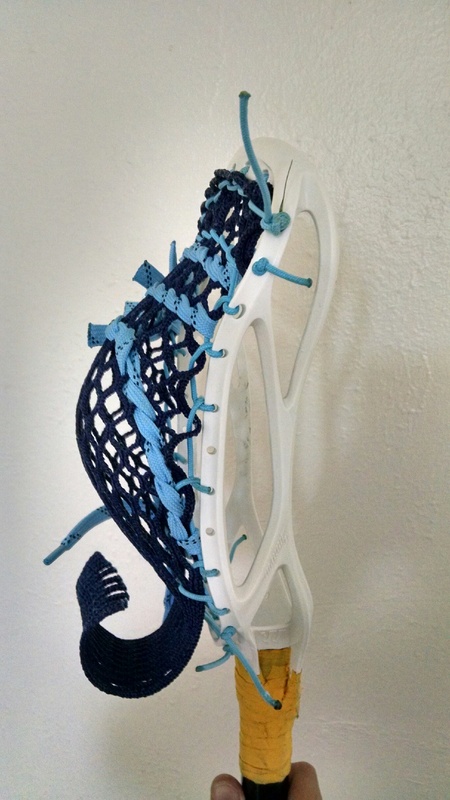 6) Shooting Strings—If this is your first time stringing, then I’m assuming you, like me, still use shooters. I like to use some leftover ‘shoe lace’ string for my top/first shooters row, but others like to use the ‘hockey laces’. This is up to you. 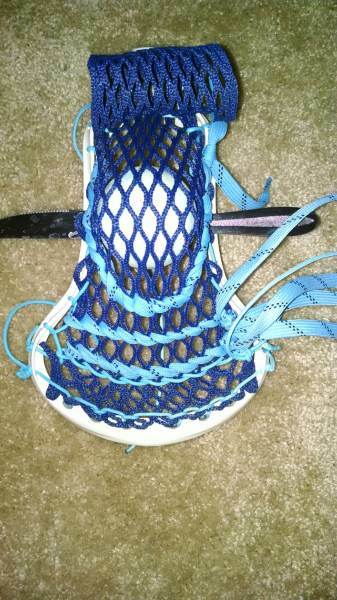 You want to slide the string in between the sidewall and mesh, and place the string so the mesh sits in the very middle of the ‘shoe lace’ string. Weave the two string ends in a spiral through each mesh hole in the same row, and pick the second or third row below the top strings. Do this again with another hockey string two rows below that one. 7) Bottom Shooter—This one can be a little tricky. Some players prefer a “V” and some prefer more of a “U.” I like a “U.” The peak of the U should be two rows below the middle shooter. I figure it out simply and trace with my two index fingers a U. The tough part is starting the bottom shooter the same way, middle of the lace, but spirally weaving it diagonally upwards, over then down. 8) From here, you have to break it the pocket. Some people use wall ball, some use “pocket-pounders” and some used pencils/pens to hold a ball. I do a mixture. First I pound in the pocket from both sides. Then I go outside for an intense wall ball session, throwing hard to catch hard and really break it in. Then I place a ball and butter knife in the stick, quickly douse it in lightly running water, and leave it for a while. The more you play, the more it’ll break in.